Feature Client Success Story – AEMM Rocks! Its super exciting when a client achieves great success, its super exciting when you helped them achieve it, and its super cool when they acknowledge your help. Having become a member of Author Expert Marketing Machines at its launch last October, I have worked on various projects with it. The most high profile work has been with New York Times bestselling author Wahida Clark, where I have been very proud to help her to design, plan & implement a campaign to support the launch of her latest book ‘Honor Thy Thug’. 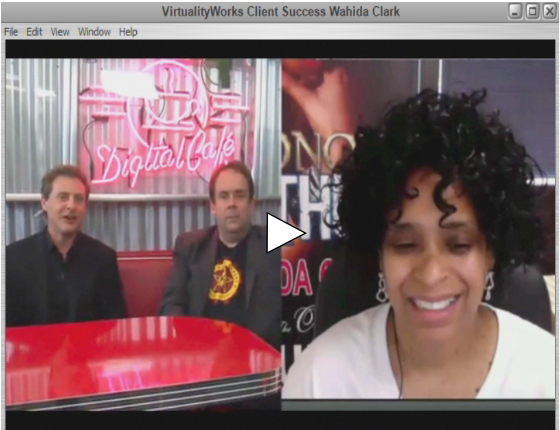 Watch this video from a recent AEMM Webcast from May 2013, where Wahida was showcased in an interview with Mike Koenigs & Paul Colligan on the particular steps that we took to support her launch, engage readers and create a list of excited book buyers. This has been quite unique approach for a fiction writer – most success stories feature people who have been selling and promoting non-fiction books and info products. We are cooking up further campaigns… watch this space !